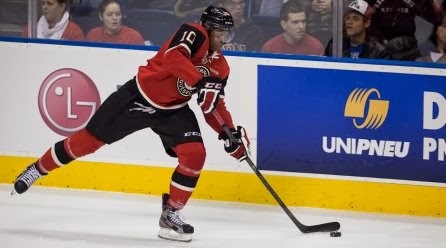 For those of you who missed out; on Monday Anthony Duclair (NYR 2013 3rd) earned his 2nd "Telus First Star of the Week" and on Tuesday, Duclair was named the CHL player of the week. Wednesday, Duclair took the day off as he was a very busy young man on Thursday night. Duclair had a 2-5-7 evening to lead his Quebec Remparts to a 8-2 whipping of the Halifax Mooseheads in a wild and sadly penalty filled game. Let us get one thing straight right from the get go as this was not a good team spanking on a bad team but rather this was Quebec (#4 QMJHL) whipping on a good Halifax (#3 QMJHL) team. Halifax actually had a 1-0 lead after 1 period as little did anyone realize what was about to happen. As the 2nd period got underway, Duclair wiped away the Halifax lead with his 43rd goal of the season just 16 seconds after the period started. The goal was scored while both teams were short a player. Just 3:32 later Duclair got point number 2 when he set up Nick Sorensen for the go ahead goal at 3:48 for a 2-1 lead. 41 seconds later with Quebec on the power play, Duclair earned point number 3 when he set up Mikhail Grigorenko's power play goal at 4:29 and a 3-1 lead on what proved to be the game winning goal. Duclair would pick up a secondary assist for his 4th point of the game (and period) on Cody Donaghey's power play goal which was also Quebec's 5th goal of the game at 14:19. Duclair would add his 5th point of the game (period) when he set up Nick Sorensen's 2nd goal of the game which was on the power play. Quebec would take a 6-1 lead into the 2nd intermission as Duclair finished the period 1-4-5. In the 3rd Duclair would pad the stat sheet thanks to Halifax taking a series of penalties which led to an extended 5 on 3. First Duclair would add his 5th assist of the game (secondary) on Nick Sorensen's 3rd goal of the game at 11:41. Then Duclair would cap off a career evening with his 2nd goal of the game and 44th on the season just 1:03 later at 12:41. Duclair in earning the game's first star has staked a claim for a 2nd player of the week award. So by the numbers, Duclair was 2-5-7, +2 on a game high 7 shots, minors for slashing and goalie interference while going 0-1 on faceoffs. As his Remparts won their 7th straight game, Duclair is now 44-38-82 for the season and is currently on a 6 game scoring streak (8-9-17) and for the month of January, Duclair is 13-12-25 for the leading goal scorer in the QMJHL and 2nd overall scorer. Ryan Graves (NYR 2013 4th) may not have had a 7 point night but his Val-d'Or Foreurs had an offensive explosion of their own as they rallied from down 0-3 for a 8-5 win over the Rouyn-Noranda Huskies. Graves had a secondary assist on the Foreur's final goal but it was his 3 hits that stood out for Graves. Graves is 3-11-14 on the season as the Foreurs pulled to within 1 point of 5th place in the QMJHL. Adam Pelech (NYI 2012 3rd) and Troy Donnay (NYR 2013 UFA) know that their Erie Otters won't be missing the OHL playoffs like they have the last 2 seasons. The Otters became the 2nd OHL team to clinch a playoff spot after they hammered the Niagara IceDogs 8-1. Pelech had 2 secondary assists and was a +3 while Donnay had 1 secondary assist and was a +2. The win also moved Erie back into first place in the OHL's Western Conference as they passed the Guelph Storm who were idle. Pelech tied and set new career highs in assists and points during this game as he improved to 8-33-41 while Donnay is 1-11-12.